This Trojan ransomware uses social engineering methods to lure users into performing certain actions that may, directly or indirectly, cause malicious routines to be performed. Specifically, it disables functionality of the compromised computer so that victims are forced to dial a premium-rate SMS number. This ransomware consistently displays an image which users from accessing their desktops and applications. Users are then forced to provide the required ransom by dialing the premium-rate SMS number displayed on the screen. It uses icons similar to those of legitimate applications to entice a user to click them. This Trojan uses icons similar to those of legitimate applications to entice a user to click them. Users are then forced to provide the required "ransom" by dialing the premium-rate SMS number displayed on the screen. Since this malware uses rootkit technology, detection and removal using normal and safe mode methods may not eliminate it completely. This procedure restarts the system using the Windows Recovery Console. Insert the Windows Installation CD into the CD drive, then Press the restart button. Upon prompt, press any key to boot from the CD. On the main menu, type r to go to the Recovery Console. Type the drive that contains Windows (usually C:) and press Enter. Type exit and press Enter to restart the system normally. Open Registry Editor. Click Start>Run, type REGEDIT in the text box provided, and then press Enter. 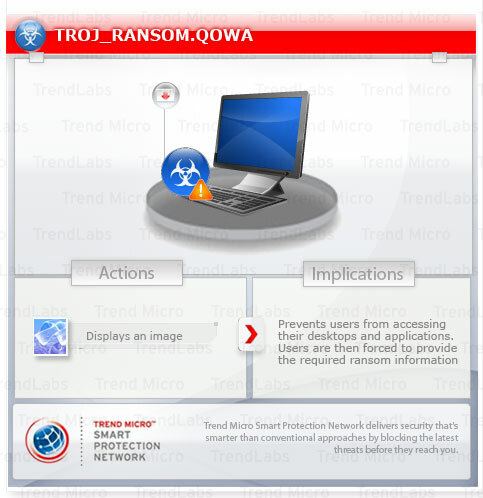 Scan your computer with your Trend Micro product to delete files detected as TROJ_RANSOM.QOWA. If the detected files have already been cleaned, deleted, or quarantined by your Trend Micro product, no further step is required. You may opt to simply delete the quarantined files. Please check this Knowledge Base page for more information.